As Development and Marketing Director for the largest hunger relief organization in Maine, I feel honored to work daily to seek solutions to help feed hungry Maine people who cannot access enough food to feed themselves or their families. There are many moments when the overwhelming responsibility of providing for the growing population of food insecure overcomes me - such as the day when a young mother and her toddler stopped by the Food- Bank. I asked the young woman how we could help her and she immediately burst into tears. She was on her day off and was desperate for food- “I can’t feed my family”, she lamented. Another day I had the privilege of attending one of our food mobile deliveries to a local food pantry. In attendance were many elderly people, families with children, and “professionals” who had lost their jobs. Although it was gratifying to be providing nutritious food, including local produce, it was sad and alarming that so many are in need and that they must line up at a food pantry or soup kitchen to obtain food to feed themselves and their families. It is these kinds of experiences and stories that motivate me daily to increase our funding sources and to help develop programs that make the Food- Bank - and Maine - more efficient and sustainable with an overabundance of nutritious food. In Maine we have a stagnant economy and one of the highest food insecurity rates in the country. More than 13 percent of our population is hungry and alarmingly that is a growing statistic. One in five children in Maine is suffering from hunger. Although eliminating poverty is the obvious solution, until that solution is reached Good Shepherd Food-Bank will strive to help feed all of Maine’s hungry. This past year we initiated a new partnership with local food providers - farms, dairies, and seafood producers - to bring local nutritious food to Mainers who are food insecure. Not only does this have a positive impact on the many receiving emergency food, but it is also stimulates the local farming community and becomes a win-win for all. We hope to continue this practice of partnering with local producers. In addition to purchasing local produce, milk, and seafood the Food- Bank will soon embark on a feasibility study in an effort to establish a processing facility to preserve the harvest for winter. We are also talking with our agency partners who directly serve those in need about establishing year-round greenhouse to provide fresh local produce all year long. Although there are many challenges to finding innovative, cost efficient ways to feed hungry Mainers who cannot feed themselves, we are confident it can be done through partnership, collaboration, and determination. EPWM encourages, and works closely with, smallholder farmers to use various farming techniques that help to restore—and hold in place—the soil. “We encourage these farmers—who are all farming on small pieces of land—to build terraces to limit soil runoff and erosion,” says Lopa. “We also encourage them to plant trees as crops and to plant trees in the areas of their land that are otherwise going unused—this helps sequester carbon in the soil and restores much needed nutrients.” EPWM also provides supplies and support, such as seeds and crop maintenance training, and encourages farmers to leave sections of their land alone to long year-long, or even two-year long, periods in order to give the soil a chance to regenerate on its own. To read more about innovations that increase harvests, mitigate environmental degradation, create access to markets and improve livelihoods, see: Aid Groups, Farmers Collaborate to Re-Green Sahel,“Re-greening” the Sahel Through Farmer-Managed Natural Regeneration , Improving Farmer Livelihoods and Wildlife Conservation, Protecting Wildlife While Improving Food Security, Health, and Livelihoods, Helping Conserve Wildlife–and Agriculture–in Mozambique, Bringing Inputs to Farmers, ECOVA MALI: Building Home Grown Knowledge, New Frontier Farmers and Processor Group: Reviving Farmland and Improving Livelihoods, The Abooman Women’s Group: Working together to Improve Livelihoods, It’s All About the Process and Turning the Catch of the Day into Improved Livelihoods. Thank you for reading! As you may already know, Danielle Nierenberg is traveling across sub-Saharan Africa visiting organizations and projects that provide environmentally sustainable solutions to hunger and poverty. She has already traveled to over 19 countries and visited 130 projects highlighting stories of hope and success in the region. Stay tuned for more writing, photos and video from her travels. In the Maradi area in south central Niger, where 70 percent of the population lives below the poverty line, the months before the harvest are called “the hunger season.” From mid-July to mid-September, food supplies are at their lowest and most families only eat one meal a day. Since the 1960’s, the entire Sahel region which includes Burkina Faso, Chad, Eritrea, Mali, Mauritania, Niger, Nigeria, Senegal and Sudan, has been experiencing increasingly extreme drought and hunger. The Maradi region has been hit especially hard and cereal harvests have dropped by nearly a third. Strained or empty grain reserves cause many families to sell tools, seeds, and livestock in order to raise money for food and the next planting. Farmers with nothing to sell are forced to work for others to earn an income. Some even leave their homes in search of work in other villages, leaving behind their wives and children to tend to the farm and home on their own. But with the help of the International Fund for Agricultural Development (IFAD), many women are taking local food security into their own hands. In response to the food crisis in the area in 2005 when severe locust attacks compounded with drought to put 3.5 million people in the Sahel at risk of starvation, IFAD’s Project for the Promotion of Local Initiative for Development in Aguie helped to create a new kind of bank, run entirely by women, that dispenses loans in the form of cereal instead of money. Called the soudure bank, or pre-harvest bank, IFAD’s project is based on exchange. Every week during the pre-harvest season, poor farmers receive cereal as a credit. At the end of the season, farmers can pay back the loan with their own crops with 25 percent interest—an interest rate that the villagers picked on their own. The banks have already made a huge difference. Today there are 168 soudure banks throughout Niger, managed by over 50,000 women and storing over 2,800 tons of millet—enough to feed 350,000 people for at least a month. During the 2008 global food price crisis, when 90 percent of the population living in Niger was at risk for starvation, villages with a soudure bank were able to sustain themselves through the harshest period of the year. And the banks help to empower women who are otherwise left out of community-wide organizations and decision making. In their new roles as bank managers, with the support of their husbands, women can now play an integral role in improving local food security, diets, and livelihoods. To read more about innovations that keep farmers on the farm, empower women, and improve food security, see: Giving Farmers a Reason to Stay, How to Keep Kids “Down on the Farm,” Conversations with Farmers: Discussing the School Garden with a DISC Project Student, Cultivating a Passion for Agriculture, Turning the Catch of the Day into Improved Livelihoods for the Whole Community, Women Farmers: An ‘Untapped Solution’ to Global Hunger and Women Entrepreneurs: Adding Value. Thank you for reading! As you may already know, Danielle Nierenberg is traveling across sub-Saharan Africa visiting organizations and projects that provide environmentally sustainable solutions to hunger and poverty. She has already traveled to over 19 countries and visited 130 projects highlighting stories of hope and success in the region. She is currently in Torino, Italy for Terra Madre, so stay tuned for more writing, photos and video from her travels. Tonight, in a few short hours, renowned hunger fighters David Beckmann of Bread for the World and Jo Luck of Heifer International will take the stage at Iowa’s state capitol to officially accept the prestigious $250,000 World Food Prize. What do they stand for and why does it matter? The co-recipients represent the importance of grassroots advocacy and the power of “push” in advancing the cause to reduce poverty, hunger and disease. Both Beckmann and Luck have accomplished legacy work in those arenas once again proving that a single individual really can shape, motivate and activate the lives of hundreds and thousands of people from direct benefactors to future advocates. During a special session, Wednesday evening, the World Food Prize laureates discussed the crucial role grassroots advocacy plays in the progress and efficacy of the anti-poverty and -hunger movement. “It really comes back to people like all of us (in the room) pushing – organized give-a-damn that will accelerate progress to reduce hunger and poverty,” noted Beckman. Through the World Bank and Bread for the World, Beckmann has had significant influence on international development programs that actually reflect the needs of the poorest people. Reflecting on a recent “big win” for advocacy, Beckman pointed to a directive issued two weeks ago by President Obama to promote economic growth for the reduction of poverty. He noted this would never have happened without the role of grassroots advocates – people talking to their legislative leaders in Congress and the Senate to support the action. “It’s the same in other countries too. Yes, it starts with politicians … but to get good political will you have to have ‘push’ institutions and people who will urge them to do the right thing for hungry and poor people,” said Beckman. Beckman knows what he’s talking about. Under his inspired leadership, he has fought for and encouraged Congress to triple poverty-focused development assistance during the past decade from $7.5 billion in FY2000 to $22 billion in FY2010; U.S. aid to Africa has quadrupled, and funding for agriculture and rural infrastructure has increased eightfold; and domestic nutrition programs and federal food assistance to needy families increased from $33 billion in FY2000 to $80 billion in FY2009. Jo Luck, who has focused on building Heifer International into one of the premier anti-hunger non-profit organizations, says grassroots advocacy is the foundation to progress and success for the anti hunger and anti poverty movement. She said that Heifer’s ability to bring food- and income-producing animals to extremely poor families, and guide them to self-reliance and opportunity for improved livelihoods through animal husbandry is due to the success of grassroots advocates who help with technical training, support and community development. Since becoming CEO of Heifer in 1992, Luck has expanded the scope and impact of its activities throughout Africa, the Americas, Asia and the South Pacific, and Central and Eastern Europe. She has created innovative public education initiatives to link grassroots donors in rich countries to recipients in developing countries, and has brought Heifer’s message of sustainable solutions to hunger and poverty directly into thousands of U.S. homes. The organization’s outreach activities have enabled 12 million families, including 1.5 million families in 2009 alone, to put nutritious food on their own tables and also contribute to feeding others through Heifer’s practice of “Passing on the Gift,” which asks every recipient family to give a female offspring of their animal to another family in need. The laureates added that it takes an army of individuals, business, academic institutions and governments working together to accelerate the progress in hunger, poverty and disease. In Cameroon, one of the foods that grows best is cassava. But farmers struggle with low yields because of pests and diseases that damage crops, making each harvest much more labor intensive than they are worth. “Farmers are spending more on planting materials and field maintenance to grow cassava and they are unable to make profit from the poor harvests,” says Emmanuel Njukwe, Chief of Service for the Crop Improvement and Utilization Unit at The International Institute of Tropical Agriculture (IITA). To help make the battle a little less labor intensive and financially costly, IITA, in partnership with the Cameroon Government National Program for Roots and Tuber Development (PNDRT), is developing and introducing improved varieties of cassava with resistance to major pests and diseases to increase production. IITA and PNDRT are also training farmers in post-harvest processing techniques to improve quality and add value to products farmers have to sell and connecting those farmers to high-paying enterprises and markets. IITA encourages the farmers’ groups to specialize in different processing options or storage techniques and then encourages them to work together. Farmers who specialize in processing cassava into flour, for example, can reach out to another group that specializes in storage and utilization for support and services. In this way, the groups can create financially beneficial links to each other, in addition to the links to the market that IITA also helps to cultivate. To read more about how farmers are improving their income and livelihoods through improved crops and processing, see: Bringing Inputs to Farmers, ECOVA MALI: Building Home Grown Knowledge, New Frontier Farmers and Processor Group: Reviving Farmland and Improving Livelihoods, The Abooman Women’s Group: Working together to Improve Livelihoods, It’s All About the Process, Turning the Catch of the Day into Improved Livelihoods and Transforming Crops into Products. Thank you for reading! As you may already know, Danielle Nierenberg is traveling across sub-Saharan Africa visiting organizations and projects that provide environmentally sustainable solutions to hunger and poverty. She has already traveled to over 19 countries and visited 130 projects highlighting stories of hope and success in the region. She will be in Turin, Italy next, so stay tuned for more writing, photos and video from her travels. The importance of having a nutritious and abundant food supply stretches far beyond agriculture in our nation and world. To have a well-fed population can mean a well-educated and more competitive society in which minds fostered with the nutrients they need to function can spur innovation and create wealth. At the National Association of State Departments of Agriculture (NASDA), where we represent the Commissioners, Secretaries and Directors of Agriculture from the 50 states and four territories, we continue to advocate for policies that will promote the vital role of agriculture in feeding a more populous and more competitive world. According to Bread for the World, a non-profit organization working to eradicate hunger, over a billion people in developing nations live on less than $1.25 per day. About 75% of these individuals live in rural areas and depend on agriculture for not only their food source, but also as a potential source of income. A large percentage of these people spend the majority of their incomes on food, while in the U.S., consumers enjoy the safest, most varied and least expensive food supply in the world. The contrast is striking. The United States has an opportunity and obligation to lead the world in efforts to eradicate global hunger. NASDA believes that providing humanitarian assistance in the form of food is important and should continue to be supported. Congress should provide sufficient funding for the United States Agency for International Development’s (USAID) budget for agriculture and continue to support the efforts of organizations such as the World Food Program (WFP). Much of the food that is delivered to impoverished areas of the globe by these programs is grown in the United States, highlighting the importance of U.S. agriculture. Domestically, there are numerous ways to provide nutritious food for the population, particularly to our youth. For instance, NASDA strongly supports fruit and vegetable nutrition initiatives such as the Fruit and Vegetable Pilot Program (FFVP), authorized in the 2002 Farm Bill and administered by the U.S. Department of Agriculture (USDA). The FFVP provided funding for schoolchildren to be exposed to produce that they otherwise may not have been able to sample. NASDA has also supported increased federal funding for food and nutrition assistance programs such as the Women, Infants and Children (WIC) and Seniors Farmers Markets Programs; Supplemental Nutrition Assistance Program (SNAP); School Meals and Child and Adult Care Food Programs; and the Summer Food Service Program. One of the most effective programs to aid in the promotion of the value of fruits and vegetables to consumers is the Specialty Crop Block Grant program (SCBG). It is administered by USDA and run through the State Departments of Agriculture. Among other things, the program provides funding to enhance the consumption of specialty crops, predominately fresh fruits and vegetables, by increasing child and adult nutrition knowledge. Projects from the program have also helped reduce costs and improve efficiency of distribution systems and have been used to improve food access in underserved communities. One excellent example from the 2010 SCBG awards includes a project where the recipient is partnering with an agency to coordinate a Farm-to-School program where school districts will purchase specialty crops from a variety of growers for direct use in school meals and provide educational assistance about nutrition to students and school personnel. Many states have developed new programs and policy tools to link producers with consumers, including farmers’ markets, commodity food projects, and increased procurement of locally grown food by institutions. NASDA proposed in the 2007 Farm Bill negotiation process a “buy locally first” approach to provide healthier and fresher commodities and to halt rising costs of warehousing, shipping and reprocessing charges that are limiting services. Underpinning this all, however, is the necessity that we look to innovative solutions, including advances in science and biotechnology, to ensure that American farmers and modern agriculture can continue to efficiently and safely feed the world. Any examination of the history of agriculture shows its vital importance. But even as the world progresses in other such sophisticated areas as communications and technology, the simple need to grow and distribute food becomes even more critical. During the past 40 years the world has seen remarkable progress by many nations in agricultural production, yet the fact remains that the future prospects for meeting world food needs still depend heavily on one nation — the United States. While the coast of The Gambia is a popular—and economically thriving— tourist destination for European vacationers, the inland portion of the country provides little means for young men to make a living. Many leave their villages for the coast or even other countries, in hopes of making more money in urban areas. This economic disparity within The Gambia, coupled with its agricultural potential, is what inspired Sandy Martin to found the Home Farm Project in 2004. The Home Farm Project works with rural communities to establish the basic training, tools and other resources needed to build a productive and income-generating farm, and give young men from the area a reason to stay. It’s not that women don’t farm too, explains Sandy. It’s just that, in addition to keeping gardens, women are responsible for caring for the children and other household chores. And it is the men who, without the proper resources to make a living from farming, find they have little recourse but to leave the villages in search of employment elsewhere. The Home Farm Project works with villages to break up community land and give it to young men who have expressed interest in farming. The organization builds wells and provides pumps to make the water more accessible for irrigation. It promotes drought tolerant plants and trees, such as moringa, in order to diversify crops, create a year-round harvest, and provide resistance to the arid climate. Many of the trees and shrubs promoted by the project can also be used as “live fences” to keep out baboons and other animals in the area that often pillage small gardens and farms. All of these plants and shrubs provide additional benefits such as fodder for livestock and help to sequester carbon in, and provide nutrients to, the soil. The ultimate goal is to help farmers build a business and as much as possible, the projects source materials used to build home farms locally. 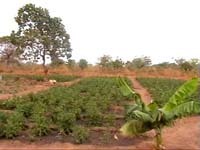 Two farmers in the Kunkoto district, for example, have, with the help of the Home Farm Project, established a Sustainability Centre or nursery, to provide other local farmers with seeds and seedlings to build their own income generating farms. To learn more about innovations that turn agriculture into a livelihood, see: How to Keep Kids “Down on the Farm,” Conversations with Farmers: Discussing the School Garden with a DISC Project Student, Cultivating a Passion for Agriculture,Improving Farmer Livelihoods and Wildlife Conservation, Protecting Wildlife While Improving Food Security, Health, and Livelihoods, and Helping Conserve Wildlife–and Agriculture–in Mozambique. Thank you for reading! As you may already know, Danielle Nierenberg is traveling across sub-Saharan Africa visiting organizations and projects that provide environmentally sustainable solutions to hunger and poverty. She has already traveled to over 19 countries and visited 130 projects highlighting stories of hope and success in the region. She will be in Senegal next, so stay tuned for more writing, photos and video from her travels. If you enjoy reading this diary, we blog daily on Nourishing the Planet, where you can also sign up for our newsletter to receive weekly blog and travel updates. Please don’t hesitate to comment on our posts, we check them daily and look forward to an ongoing discussion with you. You can also follow us on Twitter and Facebook.